Ex-Tropical Storm anyone? 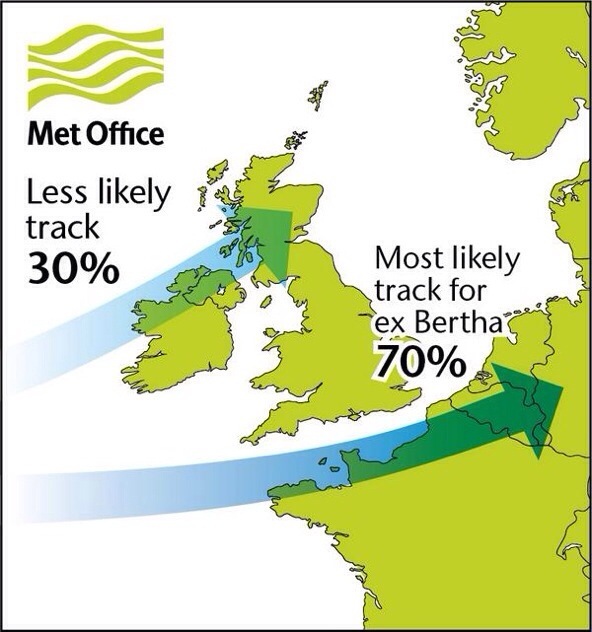 30% chance according to the Met Office (graphic). After some rain yesterday, Thursday looks much better. Sunny spells across the region with just the chance of an afternoon shower. Pleasant with highs of 21°C. Friday looks to be a mixed affair. Bright spells throughout the day but also with some showers in the afternoon which could merge to give longer spells of rain in the evening especially to the east. Highs of 19°C. The weekend doesn’t promise much. More showers on Saturday, some locally heavy but quite scattered. We are still in August so feeling nice in any periods of sunshine. Highs of 20°C. It looks like Sunday will start bright but it is expected to turn wet and windy later on as rain spreads from the south-west. This will be heavy in places. This is actually the remnants of Tropical Storm Bertha so one to keep an eye on regarding high rainfall amounts and windy conditions. The track of this “storm” could change, and even miss the UK, so watch for updates on Twitter. Highs of 19°C. Looking ahead into next week. Not much change but hopefully something more settled in the latter part of the week. No signs of a summer heatwave. July 2014 Stats: Warmest 26.2°C (24th); Coldest 9.7°C (10th); Wettest 25.8mm (19th); Windiest 27mph (3rd); Total Rainfall 69mm. This entry was posted in Weather Forecast and tagged Manchester., Oldham, Rochdale, Salford, Weather, Weather forecast by Oldham Weather. Bookmark the permalink.